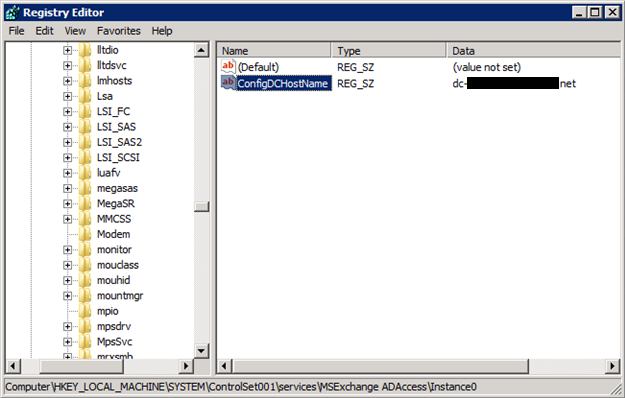 sperrgebiet's world: Setup cannot use domain controller because an override is set in the registry. I’ve the got the following error after reinstalling an Exchange 2010 Server. Setup cannot use domain controller ‘<dcname.fqdn>’ because an override is set in the registry. Run Setup again, and specify ‘/DomainController:<other dc fqdn’. The problem was that i statically assigned a domain controller to this Exchange Server after the old installation. So I tried to hint the setup brought up and ran setup.com with the /domaincontroller Parameter. But I got the same error. After a short search in the registry, i saw that there was still some stuff from the old installation. 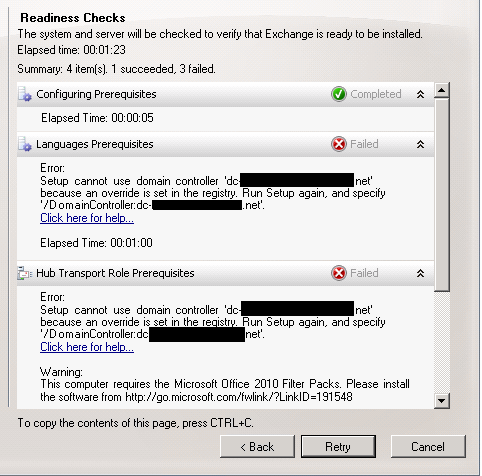 Especially the configuration from the “MSExchangeADTopology” Service, which provides the AD informations to Exchange services, was still there and caused this problem. So after deleting “ConfigDCHostName” and running setup again, everything worked fine.